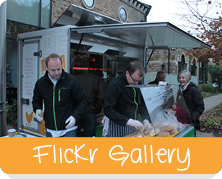 Welcome to Tasty Birds, Yorkshire's gourmet festival food caterers! If you’re looking for a catering company with tonnes of experience to serve outstanding festival food then you have come to the right place. Tasty Birds is a well-equipped chicken rotisserie company that travels the country far and wide to provide delicious street food to the hungry public at festivals and events of all sizes. We can cook up to 60 chickens in our rotisserie at a time, so there's always plenty to go around. Just because you’re at a festival it doesn't mean the food has to be boring and uninteresting. At Tasty Birds our mission is to provide all you festival goers with mouth watering and healthy gourmet food, cooked fresh in front of your eyes so you know exactly what you are eating. Bring the enjoyment back into eating at a festival and tuck into a Tasty Bird! Check out our lastest tweets on our news page!